In today’s commercial buildings, all-air variable air volume (VAV) systems conserve energy, control humidity, and can be installed at a reasonable first cost to meet a facility’s HVAC needs. But a number of alternative HVAC strategies — dedicated outdoor air systems, displacement ventilation, underfloor air distribution, and radiant heating/cooling — are thought to offer greater efficiencies and better performance. Before we delve into these alternative choices, though, it’s important to first understand the baseline and how the industry historically evolved to the point of using the standard VAV systems. When air conditioning units where first introduced in the 1930s, large, constant-air-volume systems were used to cool down large volumes of air and extract moisture from any given space. Eventually, multi-zone systems gave users control over the temperature in different spaces. However, air volume remained constant. Through the process of cooling down and warming up large volumes of air in multiple zones, humidity stayed low, but these systems required lots of energy to operate. During the 1970s energy crisis, VAV systems came onto the scene. By modulating air volume and only using as much cool air as required to ventilate a space or meet a cooling load, VAV systems significantly reduced the energy and operational expenditure of buildings. Because they meet the majority of these requirements, sturdy and dependable VAV systems have remained the standard for the past few decades. Managing the humidity load, leveraging zone control, maintaining comfort, and enabling engineers to scale up or down a project by adding as many VAV boxes as required, VAV systems enable facility managers to determine how much outside air to bring into a building. The upshot is that VAV systems get the job done and the systems can be built out at reasonable cost. So why fix what isn’t broken? The answer is that HVAC systems can be performing at a higher level. In the United States, humidity control is a big priority. As stated, VAV does the trick; however, humidity management is not one of VAV’s greatest strengths. In fact, humidity control can be compromised when air volume is varied, which raises the question: Would other technologies be able to offer more comfort, control, and reliability while maintaining energy efficiency? 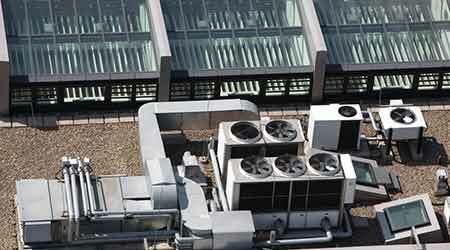 The main principle of these systems is splitting humidity control and ventilation from heating and cooling. With dedicated outside air systems (DOAS), the advantages of constant air volume — namely, reliability and humidity control — can be more economically leveraged by specifying it only for the ventilation and dehumidification aspects of the system. The DOAS can then be coupled with a number of other systems — i.e., chilled beams, induction units, fan coils, etc. — to facilitate heating and cooling. With a high level of humidity control, the space doesn’t have to be cooled quite as much, because people are generally comfortable at higher temperatures if the humidity is controlled. DOAS has been popular in Europe for some time, where it is often used to control mild humidity and deliver outside air, while fan coil units or radiant cooling/heating modulate indoor air temperature. But where humidity is a concern, DOAS is an even more compelling choice. It’s important to understand, though, that coupling DOAS with a heating/cooling system — particularly a fluid-based technology requiring pipes and valves — will come at a higher first cost. In typical commercial spaces, the perceived benefit of installing two systems may not convince building owners that the higher first cost is worth it. However, in specialized spaces, such as museums, schools, or high-end office buildings where owners are trying to attract a high-profile tenant, DOAS can be a good fit.